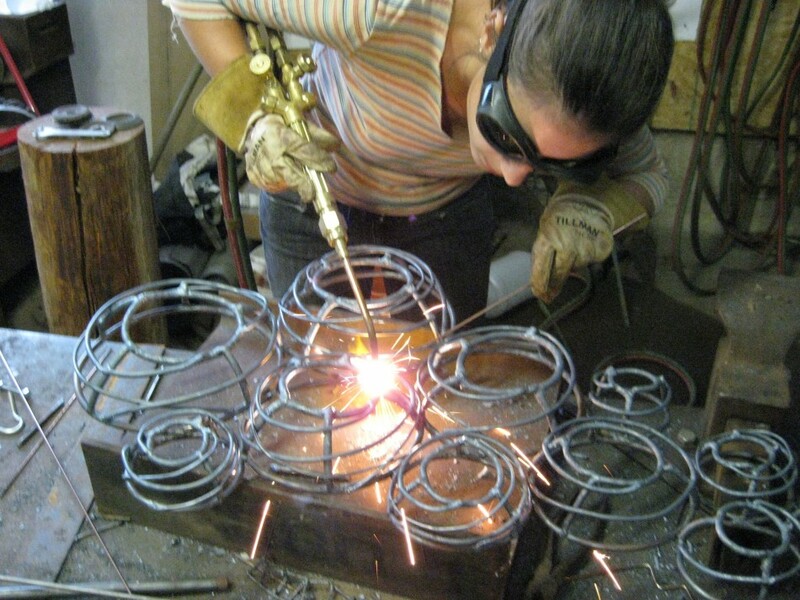 I met Katie in 2009 while she was working as a flameworking teacher at Snow Farm in Williamsburg MA. I have since discovered that Katie holds many more talents and ambitions along side her skilled glasswork. Katie is both a craftsman and fine artist working in glass and metal, an installation artist, a teacher, a youth arts coordinator, a community arts organizer, and the founder of a variety of active arts organizations in the valley. It is my pleasure to introduce a good friend and Renaissance woman! What are you trying to communicate or explore in your work? In my sculptural work I am exploring ideas of home and belonging. 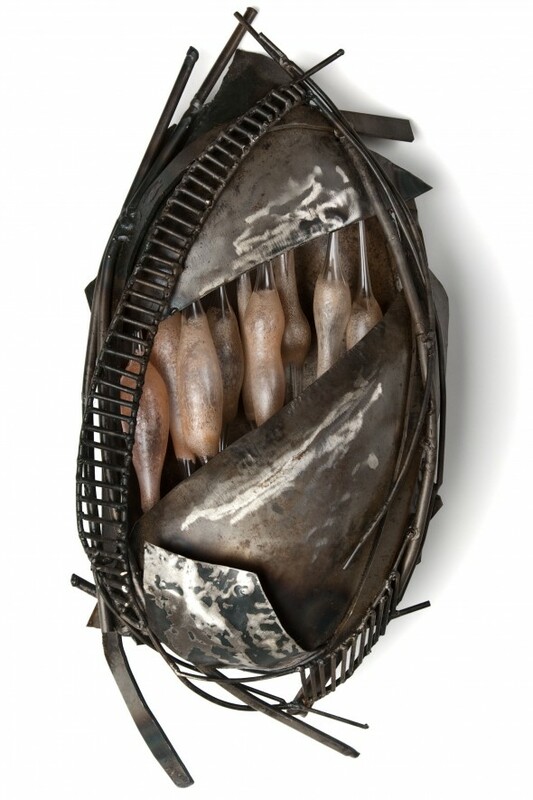 Through nest and cocoon forms, I play with the contrasts of safety/danger, fear/comfort, belonging/ exclusion. Glass and metal together also create an interesting material contrast. Glass is a delicate, beautiful, fragile material and steel was associated with structure, rigidity and strength. These materials complement each other and create a delicate balance while the forms defy the traditional characteristics associated with the materials. 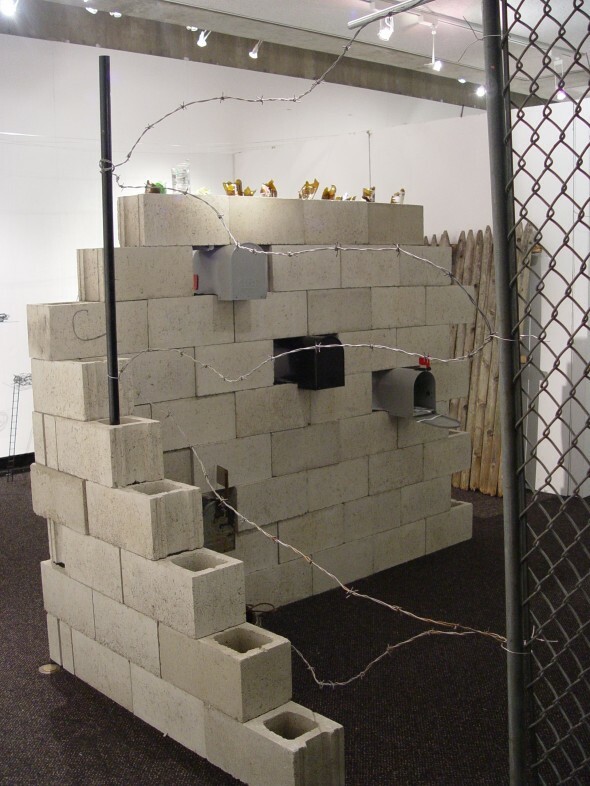 These explorations of home developed out of my installation thesis project around immigration issues called “Nos(otros): Art Questions Borders”. This and other installations I’ve made attempt to open up doors of dialogue and provoke a more open mind about the complexities of belonging across borders and the ways we approach them. 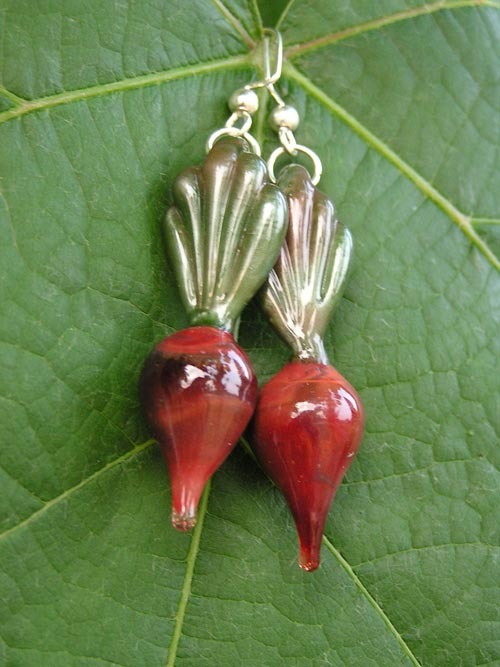 I also make small glasswork such as pendants, marbles, veggie earrings and more. These come from a love of the material, and my desire to add beautiful objects to the world. I want people to value the handmade and the makers in their communities, which is why I was a founding member of Artisans of WMASS, a local non-profit that supports and promotes artists and artisans in WMASS. Where were you when you created one of your favorite works? In my studio! 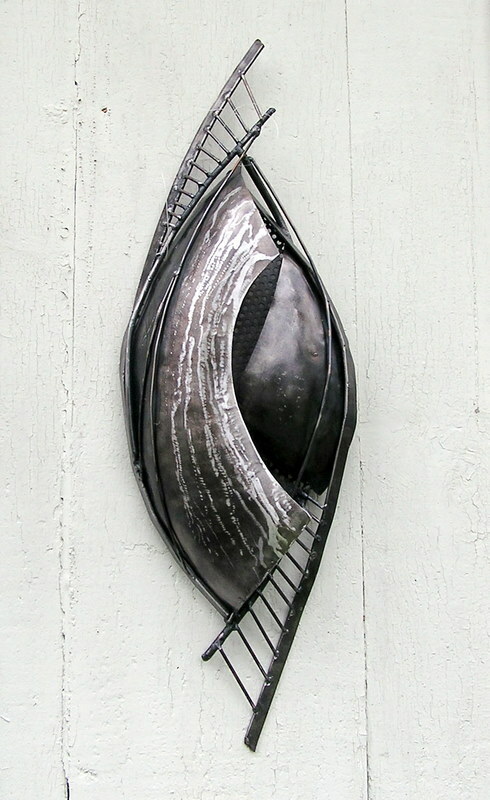 I work pretty organically when making my steel sculptures, starting with an idea but allowing the process and material to guide me. Therefore, my favorite pieces usually evolve in my studio. Torch welding allows this fluidity because it is a process where I can cut, bend, and weld with one tool. How do you see your art in relation to cultivating community, and how does community effect the work you make? I see my art in relation to community in a few different layers. I think that art is valuable for art’s sake- that it enhances our lives and community- so I make work to cultivate beauty and happiness in our community. I also hope to open up spaces for dialogue through art in my own work and in the work I do with my youth (I’m the coordinator for Get Up Get Down, a youth arts program in Amherst). Furthermore, I see collaboration as a site for community growth and social change, so I seek opportunities to work with others directly and indirectly. A new and exciting way that I see myself cultivating community is through the Spark! Art Share that I’m coordinating. Spark! works like a farm CSA, but instead of getting fresh farm produce, you get art and handmade objects from lots of local artists. Its exciting because it provides a way for people who value the arts to support a lot of local makers and collect great art each month throughout the year. There are different share levels so that it is accesible to people at various income levels. I think that everyone should have access to handmade things in their life, regardless of their means. Basically Spark! connects artists to community in a creative way that is a win-win for everyone. And it is sponsored by other community non-profits- Artisans of WMASS and Food For Thought Books. Not sure, maybe my cats. They are fierce and wild (I’m a Taurus, which is generally seen as strong and stubborn), but they are also cuddly, lazy, and enjoy a good nap in the sun. What spaces in Northampton are you most curious to see inside of, or to make work in? I like looking at the intersections of life- the decay and the growth, the strength and fragility. I like to see inside nooks and crannies, alleys and abandoned spaces. What are some strategies you use to sustain your art practice? I keep very busy which means that sometimes I don’t have enough time to create, but I’m constantly thinking about something that fuels my work. My teaching and youth work, my involvement in community groups, and other adventures are all part of the fuel. I also work across various sectors of art making- craft, fine art, and community based. Between these different avenues, I keep things varied and am able to support myself. What 5 items do you always carry with you? The basics. Scrap paper and pen are most important.